President-elect Emmerson Mnangagwa has made unsolicited confessions he sometimes meddles with court decisions, telling all and sundry Thursday he was responsible for Tendai Biti's surprise release by the courts same day. 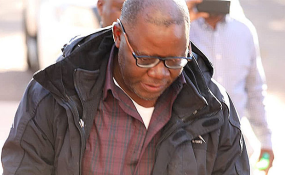 Biti was arrested as he tried to seek asylum in Zambia on Wednesday and was brought before a Harare magistrate within hours to be granted bail with strict conditions. Bail granting, which was not opposed by the state, came as a surprise to many who are used to seeing the state and its institutions come hard on opposition politicians. But in what could be seen as an act of interference with the justice delivery system in the country, Mnangagwa said through his official twitter account Biti's release came through his "intervention". "Tendai Biti was released earlier today following my intervention," he said, adding, "At such a crucial time in the history of the new Zimbabwe, nothing is more important than unity, peace and dialogue." Mnangagwa is under fire for allegedly meddling with the Zimbabwe Electoral Commission which saw his Zanu PF party romp to a two thirds parliamentary majority while he also secured a narrow victory in the presidential race. His indirect admissions he had sway over court rulings, although used on a matter involving a popular opposition leader, could vindicate critics Zimbabwean courts were "captured" by Zanu PF. MDC Alliance losing presidential candidate Nelson Chamisa is this Friday expected to file a court challenge against his electoral defeat by the incumbent. Chamisa has described Zimbabwean courts as a "slippery" route to use when one attempts to resolve matters involving the interests of Zanu PF politicians. Meanwhile, in his message, Mnangagwa described allegations levelled against Biti as serious, adding that the law must take its course on the former finance minister. "Equally important, however, is an adherence to the rule of law. I repeat - no one is above the law. "Thus due to the serious nature of the allegations of incitement, due process will continue." He added, "I call on all parties to immediately cease from all forms of incitement to violence, and to conduct all activities solely within the framework of the law. "All Zimbabweans must join us now in striving for unity, peace and reconciliation. Peace is paramount." Biti faces charges of inciting public violence and also violating the country's electoral laws through announcing results of the July 30 presidential election in which he claimed Chamisa won the disputed poll.